March 10, 2017 by Robin S.
I have a love/hate relationship with politics. On the one hand, I love theoretical politics. Various political and economic theories fascinate me, and I’ll happily discuss any current issue until whomever I’m speaking with agrees with me just to get me to shut up (filibustering is my favorite method of “winning” an argument). On the other hand, applied politics is dirty and frustrating. It involves compromises, backroom deals, scheming and hypocrisy. Even the most well-meaning politicians must be somewhat two-faced to be effective, and it makes politics as a profession somewhat dirty. Still, the idea of pure, unsullied politics appeals to me. ‘Feedback’ is the fourth book set in Mira Grant’s Newsflesh universe. The flip side of that coin is journalism. Journalists, as the “fourth estate,” are a vital part of the fabric of any free society. Where the “pure” politician is always going to be a little distasteful, the pure journalist feels like something of a hero. The little guy, looking for the truth, often pitted against the most powerful and influential of people, who have a vested interest in making sure that truth isn’t revealed. Unfortunately, as in all things, reality falls a bit short here, too. Journalists are human beings, who have their own biases and flaws. The reality of our economy and people’s short attention spans mean that click-bait and alarmist thinking are always going to get the dollars; journalists, who generally like to eat, are forced to give into that. Again, though, the concept of the journalist as the plucky hero is golden. Finally, I love zombies. Even before the glut of zombie fiction we’ve had the last few years, I’ve found them fascinating. I don’t care so much about the stories told in The Walking Dead or 28 Days Later (though, I enjoyed the first few seasons of TWD and love 28 Days Later). While I enjoy the pure action and horror of the stories, I’m more fascinated by the world building aspects of the zombie genre. What, exactly, does the presence of these eating machines do to people’s ability to survive? What impact does it have on society when a sudden heart attack can turn a mild-mannered family man into a carnivorous monster who is contagious to boot? Put all of this together, and Mira Grant’s Newsflesh trilogy (Feed, Blackout, and Deadline) seem tailor-made for me. A team of blogger/journalists are hired to follow a Presidential candidate on the campaign trail, in a world where the zombie apocalypse happened twenty years ago and is still very much a danger? Yes, please. While neither of the two sequels are quite as good as the first book (and I never quite got over some of the distasteful stuff in those novels, details of which I’m leaving out here for spoiler reasons), the first book is a masterpiece and the other two are excellent. 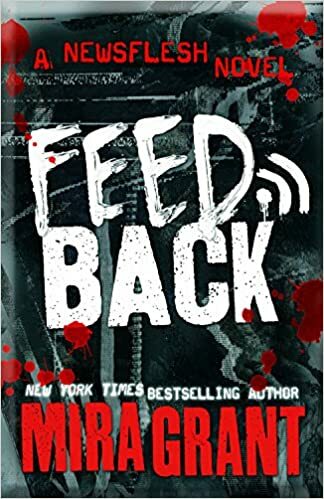 Late last year, when my reading time was cut somewhat short by the presence of a new baby in the house, Mira Grant’s fourth Newsflesh novel, Feedback, was released. According to Amazon, I bought it the day it was released, but I never really got around to reading it until today. Honestly, I am really enjoying this book, even though I have to admit that it feels like a retreading so far. As I explained above, it’s already hitting several buttons that draw me into a book, and it doesn’t hurt that I’m taking advantage of Amazon’s Whispersync and listening to the audiobook when I can’t read. I’m pretty sure that Georgia Dolenz doesn’t have a natural Irish accent (Wikipedia says she’s British), but, if her accent is fake, it’s close enough that I’d happily listen to her read pretty much anything. That’s going to add at least a full point to whatever score this book gets in my final review. 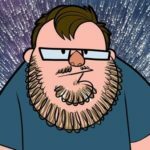 Proud father, Christian, libertarian, comic book nerd, video gamer, and Browncoat. Quick aside here: I feel like I should know whether she ends up as the eventual Democratic candidate who faces off against the Ryman campaign, but I’m drawing a blank. I love these books… why can’t I remember who his eventual opponent is in the general election? This entry was posted in Books and tagged books, mira grant, newsflesh, review in progress, zombies. Bookmark the permalink.